Today and Tonight: Clouds, scattered showers and isolated thunderstorms will stay in the forecast for Monday. There should be a few more breaks in the cloud deck compared to the weekend and this will be the impetus for showers to develop—mainly during the afternoon. High temperatures will be a bit warmer, with highs in the upper 80s. Nighttime will bring some clearing and muggy lows in the low 70s. Up Next: An upper level ridge will build and strengthen over the area on Tuesday and Wednesday, helping to drop rain chances and warm temperatures. Highs will push 90 degrees, which is about 5 degrees above where we should be in the beginning of October. Low temperatures will also stay in the low 70s, which is about 10 degrees above normal. Dew points are forecast to stay elevated in the mid 70s allowing it to feel like temperatures are in the mid to upper 90s. These conditions will be staying with us through much of the week. As we approach Friday and Saturday, the ridge will begin to weaken and travel east. This will cause temperatures top out in the mid to upper 80s, with rain chances increasing slightly. Looking beyond, there are no signs of significant cool air in the southeastern United States and the Climate Prediction Center maintains high probability for above average temperatures next week too. 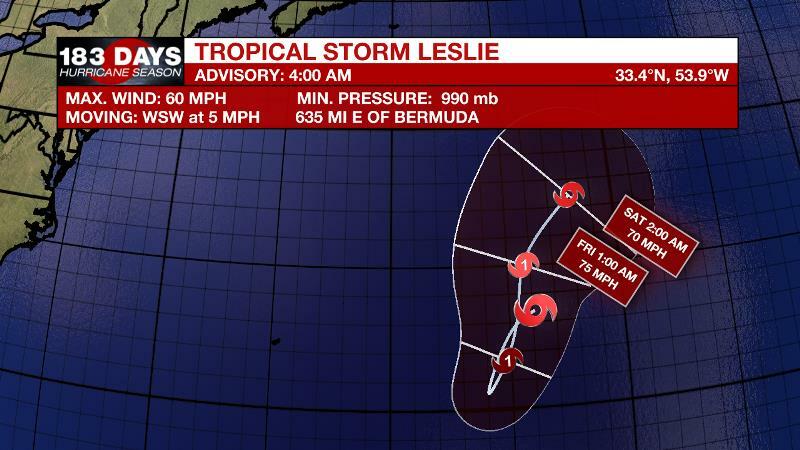 The Tropics: Tropical Storm Leslie regenerated over the weekend and remains nearly stationary in the north, central Atlantic Ocean. With 60mph winds, the system is expected to strengthen while turning around to the northeast and continuing an out to sea track. The U.S. is not threatened by this system. 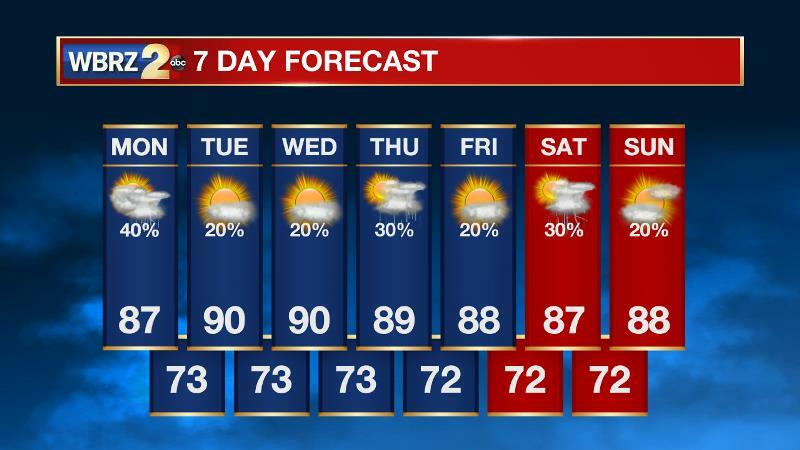 Elsewhere, no development is expected over the next 5 days. Rain will become harder to come by each day into the middle of the week as temperatures move up another few degrees. The southeastern U.S. will be dominated by a ridge of high pressure, centered over the local area by Tuesday. With the ridge on top of the region, strong subsidence should lead to convection having a more difficult time developing and with that less cloud cover as well. Expect highs in the upper 80s to near 90 and it would not be surprising to see many locations reach as warm as 92. Records in the mid 90s should not be in danger, as deep easterly flow and abundant moisture in the low levels do not usually allow thermometers to maximize. Additionally, dew point temperatures in the 70s will keep it very humid and hold low temperatures about 10 degrees above average in the low 70s. There will still be abundant moisture and therefore with daytime heating, one or two showers are possible. Needing the sea breeze for lift, the best possibility for this will be near the coast. Further inland the ridge will keep convection down to a minimum. Rain chances may finally start to improve a little at the end of the week as the ridge begins to shift back to the northeast some.